If you have decided to get an iRobot Roomba vacuuming robot so you may never have to do again one of the most boring and time consuming cleaning jobs around your home, and you may be wondering whether to get a Roomba 650 or a Roomba 980, which are two of the most popular Roomba robots sold, you have come to the right place. Though these two robots are indeed extremely popular, they present a big difference: Roomba 980 is way more expensive than Roomba 650, and not everyone can afford it. That is because Roomba 980 comes with some very advanced features that would make vacuuming your home not just a breeze, but also an enjoyable task! However, for the average home, the features that come with Roomba 650 can be considered to be quite adequate for an acceptable, if not thorough, cleaning job. In this article, we will compare Roomba 980 with Roomba 650, so you may know exactly if the features that come with Roomba 650 are sufficient to clean effectively your home, or whether it would be better for you to get a Roomba 980. This article will compare the Roomba 980 and 650 robots. 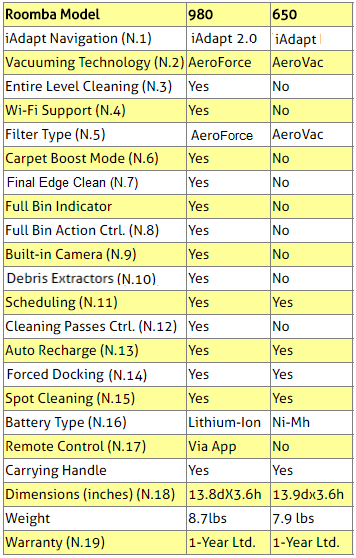 The following table compares the iRobot Roomba 980 and 650 robots. The iAdapt responsive cleaning technology composed of sophisticated software and sensors allows Roomba 650 to clean more thoroughly the room, making multiple passes, avoiding stairs, getting under and around furniture, and cleaning along wall edges and corners. 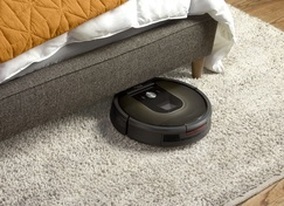 The low profile design of the robot allows cleaning under most furniture. The robot also automatically adjusts to all floor types - carpet, tile, hardwood, laminate and more. Roomba 980 was designed with the more advanced iAdapt 2.0 technology. With Adapt 2.0, Roomba 980 features a visual localization camera used to map out your home in order to ensure complete coverage. It allows the robot to seamlessly and efficiently navigate an entire level of your home and keep track of its location. Roomba 980 uses a high-efficiency cleaning pattern and a full suite of sensors to adapt to real world clutter and furniture for thorough coverage. Clearly, as you move from Roomba 650 to Roomba 980, iAdapt becomes more sophisticated and more effective. Dual Mode Virtual Wall Barriers, like Virtual Walls, can be used to block off an open doorway, but they can also be used as Virtual Wall Halos to protect some restricted area within the room, such as the area you where your dogs food is placed. Counter-rotating dual multi-surface brushes (on Roomba 650) or counter-rotating dual multi-surface tangle-free brushes (on Roomba 980) pick up dust, debris, dirt, pet hair from the floor. Note that the tangle-free brushes are also known as debris extractors. AeroForce technology found in Roomba 980 introduces the dual tangle-free brushes (debris extractors) and delivers an ideal balance of vacuum suction and debris extraction: These tangle free extractors grab and break down debris eliminating hair tangles and jams, and an airflow accelerator creates a sealed channel that concentrates the airflow, sucking in more debris. 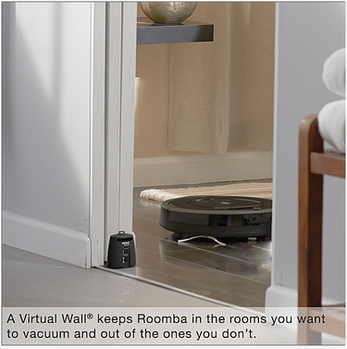 Thanks to the high efficiency vacuum, the air power is increased 5 times in Roomba 980 compared to Roomba 650. In addition, when the Carpet Boost feature found on Roomba 980 is activated, the air power is increased up to 10 times! Roomba 650 robots need to be restarted by pressing the Clean button after it recharge itself at its Home Base (unless of course it has been previously scheduled to restart at a later time). On the other hand, Roomba 980 can resume automatically the cleaning job where it was interrupted before going to Home Base to recharge. It continues this way until the job is done and the entire level of your home is cleaned! When Roomba 980 is connected via Wi-Fi to your smartphone, you can use the iRobot Home App for Android and iOS to invoke remotely operations (such as cleaning, scheduling, etc.) and to customize your cleaning preferences (such as number of cleaning passes to execute). ​Note that Roomba 980 is compatible with Amazon Alexa. Simply ask Alexa to start, stop, or dock your robot​. Roomba 980 is equipped with an AeroForce High Efficency filter that can capture 99% of allergens, pollen, and particles as small as 10 microns. 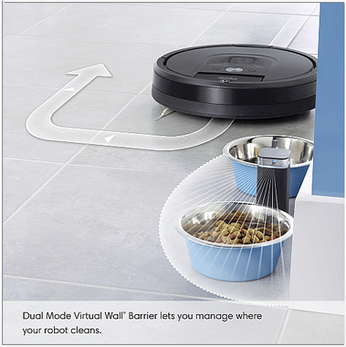 Both Roomba 980 and 650 robots are equipped with a side brush to clean wall edges. But Roomba 980 features special edge cleaning action to make sure that stubborn dirt and debris along wall edges are all removed. After the robot finishes cleaning the open areas of your floor, it uses the Final Edge Clean feature to ensure that it has cleaned along walls and around furniture legs. If you prefer a quicker clean, you can disable Final Edge Clean from the App. ​Note that this feature is turned on by default. Finish Job: Even if the bin is full, the robot will continue cleaning until it has covered the entire space. Once the bin is emptied, Roomba is ready for a new cleaning job. The full bin behavior is “Finish Job” by default. Pause Immediately: As soon as the bin is full, the robot will return to where it started and pause its cleaning job. Once the bin is emptied, you just need to press CLEAN to resume. Roomba 980 is equipped with a visual localization camera that maps out more thoroughly your home in order to ensure complete coverage. It allows the robot to seamlessly and efficiently navigate an entire level of your home and keep track of its location. Note that for the camera functionality to work properly some light in the room where the robot will be vacuuming may be needed. The tangle-free brushes (also known as debris extractors) ​ found on Roomba 980 grab and break down debris, eliminating hair tangles and jams, and an airflow accelerator creates a sealed channel that concentrates airflow, sucking in more debris. In most cases, Roomba will remove dirt and debris with just one pass over each area of your home. With Roomba 980, two-pass cleaning can be requested and can be particularly helpful in homes with pets or for periodic deep cleaning. The number of cleaning passes is one by default. This feature can be invoked from the App. ​Note that Roomba 650​ needs to be restarted by pressing the CLEAN button after it recharges itself at its Home Base (unless of course it had been previously scheduled to restart at a later time). Roomba 980 is able to resume automatically the cleaning job where it was interrupted before going to Home Base to recharge. It continues this way until the job is done and the whole level of your home is cleaned. Both robots are equipped with a Home button that can be pressed to send the robot to dock at its Home Base. Of course, the robot will also go automatically to its Home Base when battery runs low. Roomba 650 has a Nickel Metal Hydride (Ni-MH) battery, while Roomba 980 has a Lithium-Ion battery. iRobot has specified the average battery run time for Roomba 980 robot as 120 minutes. For Roomba 650, the average run time is about 60 minutes,. Note that for both robots run times can vary extensively depending on the amount of work the robot has to do to clean the floors. That is because different types of carpets, different floor plans and different amounts of dirt may require different amounts of effort from the robot and hence different amounts of ''juice'' from the battery. Roomba 980 can be remotely controlled from your smartphone or tablet using the iRobot Home App. No explicit remote-control device is provided. Roomba robots are high quality products as shown by the average rating of at least 4.5 stars (out of 5 stars) each of the Roomba robots considered here had received from Amazon customers at the time this article was written. As you progress from Roomba 650 all the way up to Roomba 980, you will basically notice more powerful vacuuming and more thorough floor coverage. But as to be expected, the latest model will also cost you more. It uses camera based visual localization which helps the robot seamlessly and efficiently navigate an entire level of your home and keep track of its location (note that for the camera functionality too work properly some light in the room where the robot will be vacuuming is needed). It uses a high-efficiency cleaning pattern and a full suite of sensors to adapt to real world clutter and furniture for thorough coverage. It has the capability, after it recharges itself at Home Base, to resume operation automatically where it had been interrupted. So, if you have large areas in your home that require the robot to recharge multiple times, and you don't want to bother with having to restart the robot after each recharge, you might want to consider Roomba 980, as it is capable of completing the job without human interference, except for emptying the bin when it gets full. And even if the bin gets full, and for some reason you aren't available to empty it, the robot will continue vacuuming until the entire space is covered and the job is finished, unless you have requested from the App to stop vacuuming at full bin. Though the above listed Roomba 960 additional features can be quite useful in certain situations such as in large homes, for normal size homes, and unless you wish to use your smartphone to control the robot, you would probably be more than satisfied with the vacuuming results obtained with Roomba 650. But remember that one of the main difference between them is the vacuuming technology used. Roomba 650 use the AeroVac technology, while Roomba 980 uses the AeroForce technology. ​As described above, AeroVac 2 provides powerful and efficient vacuuming that pulls hair and debris from brushes and sends it into the dirt bin. On the other hand, AeroForce delivers the ideal balance of vacuum suction and debris extraction by using debris extractors that grab and break down debris eliminating hair tangles and jams. In addition, with AeroForce, an airflow accelerator creates a sealed channel that concentrates the airflow, sucking in more debris. Thanks to the high efficiency vacuum of AeroForce, the air power is increased 5 times. - Roomba 980 has a more powerful motor and supports the Carpet Boost feature, while Roomba 960 does not. For a detailed comparison of Roomba 980 and Roomba 960, please click: Comparing Roomba 980 and 960.